When Albert Einstein passed away in 1955 he wasn’t sure anymore about the existence of Gravitational Waves, original predicted in 1916 on the basis of his theory of general relativity. 60 years later on September 14th, 2015, the LIGO ( Laser Interferometer Gravitational-Wave Observatory ) detectors in Hanford and Livingston registered a compression strain of space by 10-19 meters, 1/10.000 times the diameter of a proton, through two 4 km long arms in which laser beams have been travelling back and forth 400 times, an event from now on becoming popular under its name GW150914. The event was caused by two black holes colliding 1.3 billion light years away from Earth, each having a solar mass of 30. I always find it amazing what physicist discover these days and what complex machines they build to answer fundamental questions about the creation and existence of the universe. LIGO has cost 1.1 billion dollars and it took 40 years to build it. Another even more famous example of such a machine is the Large Hadron Collider (LHC) built by scientists and engineers from 100 countries for 3 billion dollar – to discover the Higgs-Bosom, the last missing piece for the Standard Theory of particles. I find it amazing what math they use and what conclusions they draw from the signals they measure, thoughts most human beings including myself never will be able to follow. They create the sort of knowledge we can only believe in, which often is just valid temporarily before it becomes overruled by new insights through even bigger and more complex machines and theories. 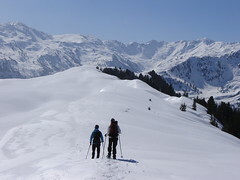 I have been on snowshoe-hiking vacation for the past 2 weeks. We stayed in a beautiful hotel in the Wildschönau in Austria, not far away from Kufstein. Photos from the awesome trip and hikes we made can be found in my flickr account. "Only a few know how much you need to know to know how less you know"
From the "Fliegende Blätter", a humorous-satiric magazine, published in Munich between 1845 and 1944. Over the weekend my wife and I visited some relatives living in Regensburg and we have had some good discussions about several topics – from blood cholesterol level to politics to the magnetic polar reversal scheduled for December 21, 2012. I noticed: common knowledge doesn’t exist. People know, what they want to know. They filter and interpret facts according to their believes. A common body of knowledge doesn’t exist for human mankind, nor for any group of people, for any culture, community or company. People are different, and everyone is having his own version of the truth. And so I sit, poor silly man No wiser now than when I began..
For every fact you can come up with evidences, but you can also come up with evidences to refute it. It is more a question of belief which evidence you accept and who you trust, who’s book you read and who’s you criticize, probably without even reading it. Do you trust your doctor more than one who you don’t know and who has written a book titled “The Cholesterol Lie” ? Do you believe those who announce world’s end knowing that so far the world never ended before, which of course is no evidence that some time in the future it might happen ? Do you think our politicians are telling us the truth, our leaders really lead us, scientist and experts acknowledge wisdom and insight more than their carrier ? 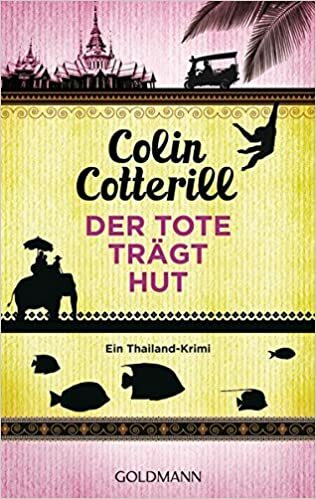 “I know that I know nothing” said Johann Wolfgang von Goethe’s Faust. This is probably the only truth you can come up with, besides certain facts from mathematics where true evidences really exist – as far as I can tell. Facing the tragedy in Japan I am not posting any my_favorites type of posting this week. Instead I want to elaborate just a bit about the topic of information mining, “truth” and “trust”. I believe information mining is what we all do a lot in these days. We watch the news, read the papers, may be seek further sources of information to grasp what is really going on in Japan, what the impact will be in Japan, in neighbor countries and around the globe. I am actually not writing about the massive earthquake and tsunami killing thousands of people, I am more focusing on the serious trouble with those nuclear reactor in Fukushima. I don’t know about you, but I have consumed a lot of information about this. Did it make me smarter ? To some extent. Did I find the truth about what has been happening and is going to happen ? No. Can I trust anyone, the smart looking, or sometimes very anxious looking speaker in TV, the “experts” they call in ( some of them are experts, everyone is an expert in something, how do I know, how do I verify ? ), the politicians in Japan, our politicians in Germany, the management of TEPCO ? I don’t know. Which basically is a no. Where is the truth ? Everyone has his or her own agenda, and is “speaking the truth” part of it ? Would the truth may be hurt more people then help ? Is the truth simply unknown, but experts can’t show this to not cause more panic ? And finally, doesn’t everyone have his own version of the truth ? And depending on what you tend to believe you pick the people you believe as trusted sources of information. In other words: you hear what you want to hear. The best article I found so far was “Fukushima Nuclear Accident – a simple and accurate explanation” on the bravenewclimate site, their latest update is here. As valuable as the article are the hundreds of comments I saw there. What I liked about these articles is that they try to come up with as much facts as possible and with a more scientific and fact-based attitude, more than any of the news reports I saw in TV or the internet. Are these facts true ? I don’t know. Who is sponsoring this site ? I don’t know. Can I trust this site ? No. Only to some extent. Where is the truth ? Somewhere in between all these pieces of information I receive. To some extend. I need to do my own information mining again. I admit I went out to Wikipedia to learn about Sievert: what is it, what is a natural dose, where is the limit to call it harmless, where is the limit when it starts to harm your health ? There are so many ways to measure radiation ( and Sievert was invented to more normalize and focus on the impact on the human body no matter what type of radiation we encounter ) and this unit of measure is not something we use every day and are very familiar with. Even the speaker of TEPCO confused micro-Sievert with milli-Sievert some days ago. Let me conclude: even in the era of knowledge management and the power of the internet with all its search and hyper-linking capabilities and all the media we have at the end we are left alone when it comes to find the “truth”, the ultimate knowledge. May be actually “truth” is a myth, there is only “knowledge”, and everyone has its own. Which basically is “belief”. Documentation is always important, not only in your life as a professional, but in your private life as well. Think about the special knowledge you possess, for instance about your finance matters or technical equipment in your household. Does your family depend on your availability all the time, or do you have enabled them to fix problems on their own through some documentation or training you have provided ? This comic strip from “Herman” is nicely drawn and funny, but there is also a lot of truth and food for thinking in there. How much does your team in the company depend on your availability ? Have you been professional enough to provide good documentation about your job and responsibilities and enabled them to solve problems on their own ? Or do you prefer them to be dependant on you ? What is true for a man might be true for a woman as well, right ? We all know: communication can become quiet difficult. This funny sketch demonstrates how difficult it can become if someone starts to speak a very uncommon "language": "Funny Hugh Laurie & Stephen Fry Comedy Sketch! ‘Your Name, Sir?‘ "
The last Space Shuttle mission is scheduled for February/March 2011: Space Shuttle Endeavour is supposed to deliver some parts to the ISS and an antimatter measuring instrument into the orbit. 132 Space Shuttle missions have been accomplished so far, 2 more are scheduled, 2 ended with a complete disaster ( Challenger in January 1986 and Columbia in January 2003 ), making that program less reliable than attempted. More than 2000 tons is the weight of a space shuttle during take off, 24 tons is the weight of the cargo it can lift into the orbit. 355 astronauts have used a space shuttle to get into the orbit, among them 332 US astronauts and 7 Germans. 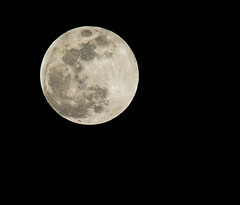 Taking into account those who used it multiple times 787 human beings have been taken into space using this program. 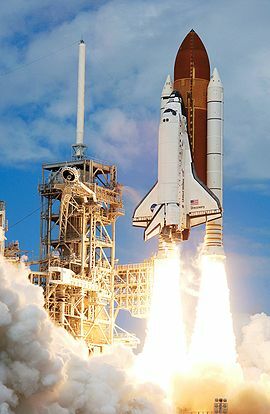 Discovery is the shuttle with most missions ( 39 ), spending 363 days in space, orbiting Earth 5.400 times, flying a distance of 213 million kilometers in total. All shuttles together have orbited Earth 21.000 times and flew 850 million kilometers. Longest mission was performed by Columbia in November 1996 lasting 17 days and 15 hours. Discovery reached the largest height in December 1999 with 609 kilometers during the third Hubble repair mission. 32 times a shuttle docked at the ISS, 9 times at the Russian space station Mir. Shuttle astronauts have delivered 63 satellites into the orbit plus 13 research units which returned to Earth. 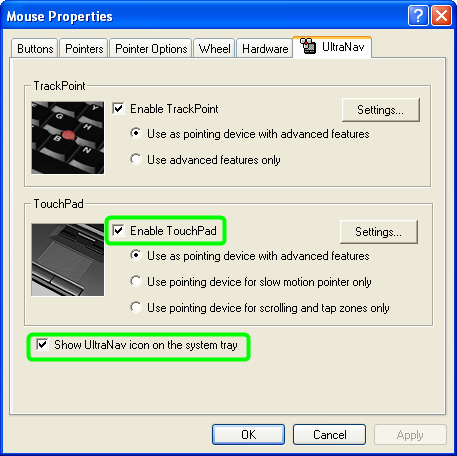 Something to learn: my favorite tip of the week – about the touchpad on your thinkpad. Does it sometimes gets into your way ? You are typing in a lot of text and suddenly your windows starts scrolling automatically like crazy ? Because you have somehow touched the touchpad ? Sometimes it might be a good idea to simply disable it, especially when you don’t use it usually anyway. Head to Start –> Control Panel –> Mouse, then open the “UltraNav” tab ( at least that’s how it works on my Lenovo W500 thinkpad with Windows XP installed ), then uncheck “Enable Touchpad”. Now, what if you need it sometimes ? If you check on “Show UtraNav icon in the system tray” you get that little icon into the system tray which allows you to enable or disable it any time with just two clicks. Left-click on that icon, that click on the menu item “Enable Touchpad” or “Disable Touchpad”. "Illa de Arousa" by Noel Feans. I like this photo because of the nice light and shadow effects and the interesting atmosphere it generates. It has been taken by Noel Feans somewhere in Spain and is called: “Illa de Arousa”. There is probably something wrong with this comic strip from “Reality Check”: I am not aware that books have been available in those early phases of evolution. Well, that’s probably why this series of comic strips is titled “Reality Check”. Anyway, funny it is …. Knowledge consists of facts, but what are facts actually ? Facts are pieces of information which have been verified – sort of. At least we think so. Anyway, this is where a Fact Checker Unit comes in. Fact checking - a new profession in the realm of knowledge management ? Facts can be verified – or made. This funny video featuring Bill Murray is not only well done, it gets us some food for thought. 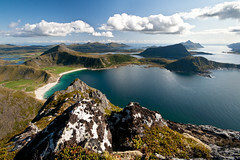 A “Breathtaking View” from the top of a mountain on the Lofoten, taken by Ram Yoga from Norway. "Breathtaking View" by Ram Yoga. "Tiger Swallowtail caterpillar" by Vicki DeLoach. 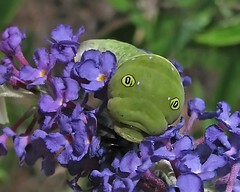 A “Tiger Swallowtail caterpillar” photographed in a butterfly bush by Vicki DeLoach from USA. 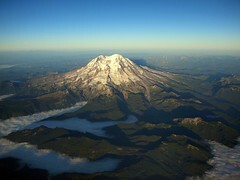 “Mt Rainier in the sky”, photographed by Kyle Wang on his flight to LAX. "Mt Rainier in the sky" by Kyle Wang. I guess that sentence is true somehow. Reality is that my 3-week-vacation is over now and I am back to work. And after reading 285 e-mails, filling out some strange forms and hearing about upcoming org changes and obscure political maneuvers in my company I have to say: I can’t stand it. I didn’t know we played golf already B.C. According to Wikipedia this started in the 15th century. Anyway, this little comic clip is a nice example of a complicated solution which usually looks more interesting than the simple way to success. But only if it works. If it doesn’t it suddenly might look pretty stupid. Something to keep in mind next time when designing a solution for a customer. A nice recommendation from Lifehacker this morning: “Unsuck It Translates Awful Corporate Speak into Plain English”. How do you like this one: “Accelerated Emergence of High Maturity Behaviors” ? If you need a translation, visit http://unsuck-it.com/. I was wondering whether “Low Hanging Fruits” are in there as well, one of my favorites. Of course they are ! How is “learning” expressed in corporate speak ? “Knowledge Acquisition”. “Sharing information” ? Check it out yourself. 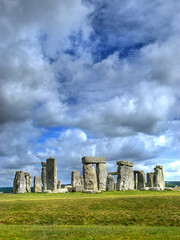 Here is a nice shot of a famous place from MarcelGermain from Barcelona: “Stonehenge”. 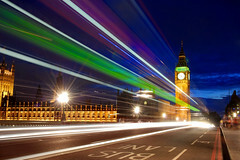 Just today he came up with another awesome photo: “A postcard from London II”. "A postcard from London II" by Marcel Germain. I don’t necessarily agree to the first part of the quote, but definitely to the second part. Usually we fear the unknown, and as the unknown becomes better known to us fear usually goes away. Like when you join a new project: at the beginning you might be full of fear and uncertainty. As soon as you get more into it and start knowing more and more about it you know how to put your hands around it and how to deal with it. Even if you realize you ended up in a troubled project, as soon as you know this and where the trouble is you have means to address this and thus move your fear aside. The fear becomes a challenge then, may be even an exciting one.